I’ve been playing with some contact tow ideas for sea kayaks for the past few months, looking at what others have done and thinking about the times I’ve used one over the past 13 or so years as an instructor. I’m fan of the one designed by Ed Schiller of the Virginia Sea Kayak Center, but wanted something even simpler. My goals are less line all around, easier/faster quick release, and unconscious competence — not having to think through what goes where. I also found that almost every option I tired involved a carabiner or clip that was fairly snug to an existing deck line, and getting those unclipped and deployed under pressure was a bit of a hassle. Enter the rap-ring contact tow. The idea is fairly simple and cost-effective to build. There’s a line across the deck parallel to the deck bungee, tied to the deck line on either side (it goes over paddles or gear on the deck). A lightweight descender ring (or rap ring, your favorite climbing gear store can hook you up) is threaded on that line. That part stays attached to the kayak. I pushed the rap ring under the deck bungee during transport. 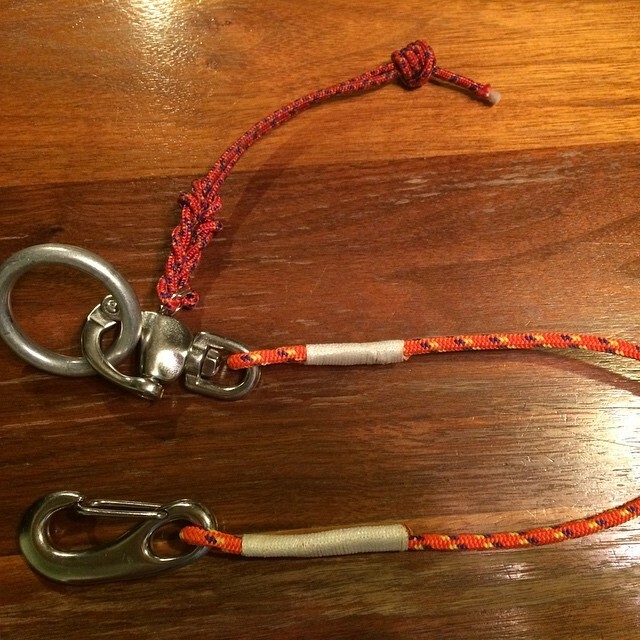 The second piece is a short piece of line with a quick-release snap shackle on one end and a small carabiner on the other end. The total length is about 20 inches. The snap shackle gets hooked the rap ring. 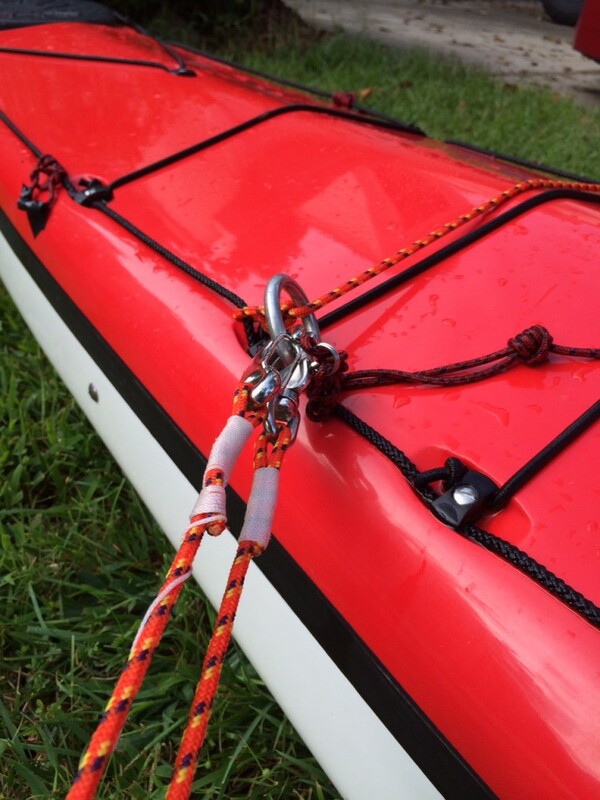 Now you have a contact tow that can easily be deployed to either side of your kayak. 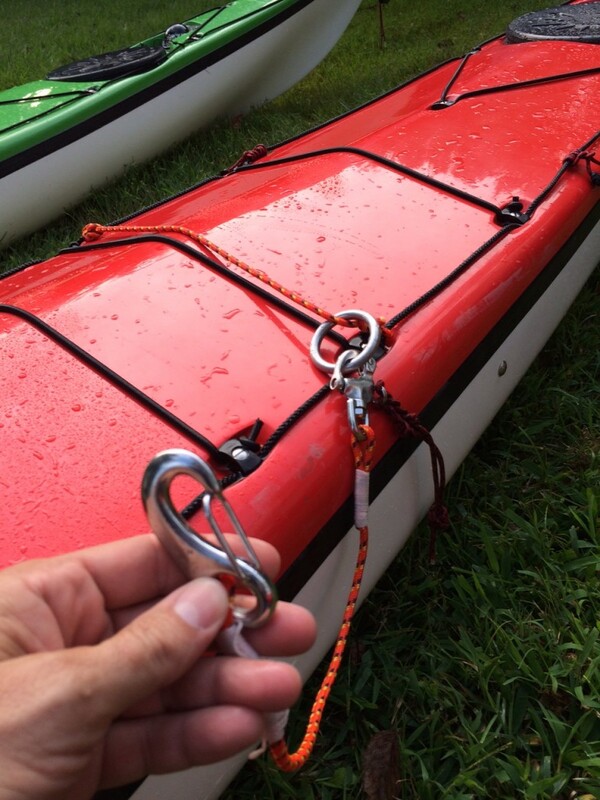 There is only one carabiner to work with — you simply hook it to the other kayak deck line and start paddling. The ring will slide to whichever side the other kayak is on. If you need a shorter tow, you run the biner under the other kayak’s deck line and back to the rap ring. For an emergency disconnect, tug the quick release and you’re disconnected. Note, the snap shackle may get hung under the other boat’s line if you have doubled back under to the rap ring. However, I don’t anticipate needed the shorter length — it’s rare that I’ve needed boats that tight. When paddling and stowed, you can run the line from the ring, under the bungee closest to you, and then back to the ring and clip it. 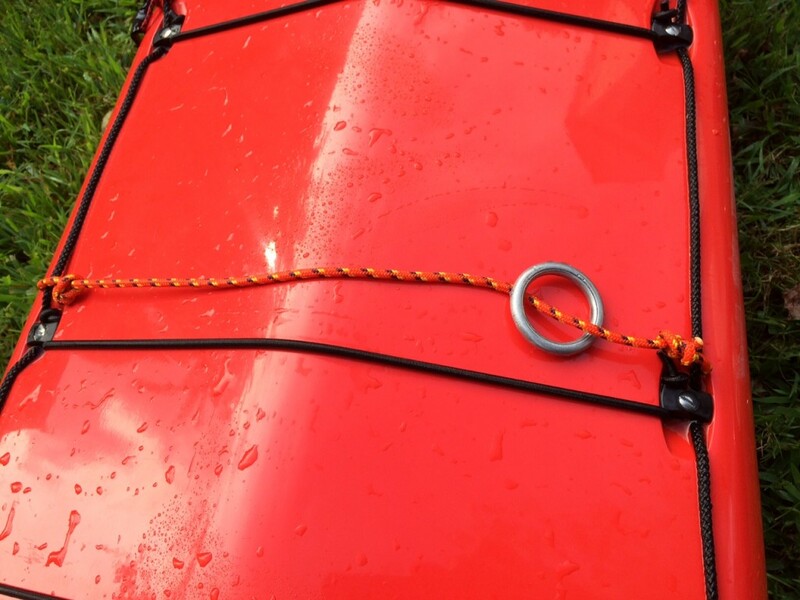 Or, simply clip the biner to the ring and stow the line under your bungees (quickest to deploy). Like anything, this approach isn’t perfect, and has probably already been done before. But, so far initial testing is working out well, and I like the quick-release option for the type of paddling and instruction I do most often. It’s a possible tool for the tool box. Not better than others, just a different approach based on my experience over the years. Your milage may vary. If you’re going to the Kiptopeke Symposium this week, you can check it out.